We are not a traditional law firm. At The Tech Law Group, we believe in a results based system. We may handle a matter for a reduced flat fee payable in installments plus a contingency (typically 20%) if the specifics of your matter call for it – we see this as a “win-win” proposal where we are both on the same side of the table. 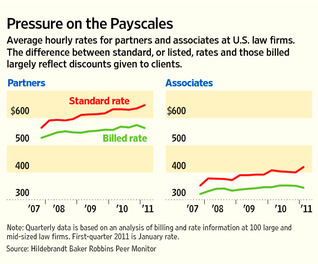 We leverage technology to keep our overhead costs low and pass the savings along to our clients.� Because we run our firm like an emerging growth company, our bill rates are significantly lower than the average hourly rates displayed in this chart.� Paying less for the same level of legal service gives our clients a competitive advantage.